Now in its 12th edition, BK Magazine's Top Tables remains Bangkok’s most trusted local guide to fine dining. Each restaurant in the guide is selected by a panel of 30 foodies, bloggers, journalists and F&B professionals free from affiliation with restaurants in the guide. Check out the full list here. Below you'll find videos of the top 10, showcasing dishes in all their delicious glory. No. 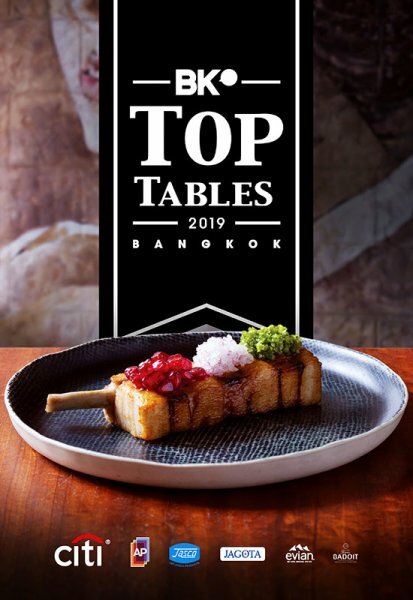 10 in Top Tables 2019: Sorn ศรณ์ We’re counting down the best restaurants in Bangkok. Stay tuned for the full list of 100 restaurants announced tonight! No. 9 in Top Tables 2019: Le Du We’re counting down the best restaurants in Bangkok. Stay tuned for the full list of 100 restaurants announced tonight! No. 8 in Top Tables 2019: Eat Me Restaurant We’re counting down the best restaurants in Bangkok. Stay tuned for the full list of 100 restaurants announced tonight! No. 7 in Top Tables 2019: Paste Bangkok Thai Cuisine We’re counting down the best restaurants in Bangkok. Stay tuned for the full list of 100 restaurants announced tonight! No. 6 in Top Tables 2019: L'Atelier de Joël Robuchon - Bangkok We’re counting down the best restaurants in Bangkok. Stay tuned for the full list of 100 restaurants announced tonight! No. 5 in Top Tables 2019: Bo.lan We’re counting down the best restaurants in Bangkok. Stay tuned for the full list of 100 restaurants announced tonight! No. 4 in Top Tables 2019: Le Normandie at Mandarin Oriental, Bangkok We’re counting down the best restaurants in Bangkok. Stay tuned for the full list of 100 restaurants announced tonight! 3. Gaggan's one and only "Lick it Up"
No. 3 in Top Tables 2019: Gaggan We’re counting down the best restaurants in Bangkok. Stay tuned for the full list of 100 restaurants announced tonight! No. 2 in Top Tables 2019: Gaa We’re counting down the best restaurants in Bangkok. Stay tuned for the full list of 100 restaurants announced tonight! No. 1 in Top Tables 2019: Restaurant Sühring We’re counting down the best restaurants in Bangkok. Stay tuned for the full list of 100 restaurants announced tonight!